I watched an illustrated video of an illustrated speech by Ken Robinson on changing education paradigms. I believe the paradigm shifts he calls are also needed in the development process of software and information products. lots of possible ways to interpret a question. lots and lots of possible answers to a question. Interaction designers engage in divergent thinking when they explore multiple ideas and try to “saturate the problem space.” Initially, this exploration isn’t linear or convergent. Instead, it’s about trying different things, borrowing ideas, letting go of ownership and letting go of the idea that your idea is too good to edit or to combine with the ideas of others. Brainstorming is a structured form of divergent thinking. Only after the divergence—after the problem space is saturated with ideas—is it time to converge, to assess, to use judgement, and to make design decisions. You can engage in a divergent-then-convergent process on your own, but for people new to the process, results are much better when they can borrow and combine each other’s ideas during the divergent stage. In the workplace this is called collaboration, and we need to add it to iterative, Agile development processes. If development teams find collaboration difficult, it could be because of the paradigms we learned at school. As Robinson points out, the education system refers to sharing as copying, refers to re-using as plagiarism, and sees both as forms of cheating? Although children innately engage in divergent thinking, Robinson cites a study from Break Point & Beyond that shows how our ability to think divergently dries up as we pass through the education system. 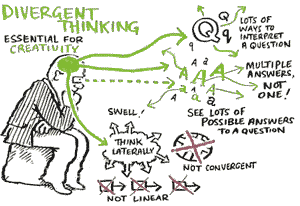 In school, divergent thinking is a fish out of water. At work, we need to put the fish back in the water. In the table, above, compare where business ranks originality and inventiveness versus where schools rank it. Similarly, note the contrast between problem identification and problem solving. Make sure the vision and mission are clearly communicated. This helps others to understand the problems to solve. Remove the bureaucratic obstacles that strangle creativity. Create a climate for an open flow of ideas, collaboration and knowledge sharing. Freedom and trust are key to creativity. Embrace diversity. The more personality types (or team roles) are on the team, the more likely the project will succeed. Give employees an opportunity to reap the rewards of the success they helped create. Stage celebrations to benchmark success. Cultivate continuous learning. Revitalise by cultivating outside interests. A 12% improvement in performance suggests that 7 people with large displays could theoretically do the job of 8 people with medium displays. How many large displays could your office buy for one person’s salary every year? For business-to-business sales and especially for enterprise-wide software implementations, there’s a place for sales teams and proposal writers to mention the business case for larger displays. Call it what you want—innovation, thinking outside the box, providing solutions—your UX-Design team can work with the Sales and Service/Implementation teams to ensure customers get solutions that include better hardware choices. Shifting high-concentration work to times when fewer people are around. Doing high-concentration work in single offices. I suppose working remotely—from a quiet home—is a variation of these solutions. I also asked, “What one thing, if handled differently, would most improve the way people experience noise at work?” Schlittmeier said it’s not about one thing. She recommended attacking problem sound from all dimensions at once: loudness, frequency characteristics, sound production, transmission, and so on. The way I read the research results, reducing background speech to a soft, unintelligible noise could result in a 10% to 25% decrease in memory errors and logic errors, and an 18% increase in attention span. What Schlittmeier hasn’t provided is data about overall productivity improvement, without which it’s harder to make a business case for spending on office-noise abatement. But there are other ways to mitigate the background office noise that affects your users, and you may be able to influence how your customers approach that problem. Again: call it what you want—innovation, thinking outside the box, providing solutions—your UX-Design team can work with the Marketing team to influence the environment through traditional marketing. 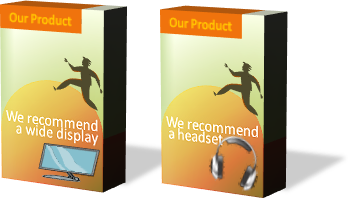 Imagine a business-to-consumer product that is designed to work even better with a (noise-cancelling) headset—and which is depicted in use with headsets in the marketing messages and on the packaging.